President Clinton and First Lady Hillary Rodham Clinton highlighted the Charters of Freedom Project of the National Archives and Records Administration at the Rotunda of the National Archives this Thursday, July 1. The Project will better preserve our founding documents -- the Declaration of Independence, the Constitution of the United States, and the Bill of Rights -- as well as increase their accessibility to visitors in wheelchairs and improve their exhibition to encourage a deeper understanding of their influence on our unique and lasting democracy. The President and Mrs. Clinton also acknowledged support for the project from AT&T and The Pew Charitable Trusts, as well as from Congress, which supported the President's request for funds in his 1999 budget. The Charters of Freedom Project: Re-encasement of the Charters and their increased display and interpretation. As we move into the next millennium, the National Archives and Records Administration is implementing a plan to better preserve the documents, history and spirit of the Charters. Using an imaging system developed by NASA's Jet Propulsion Lab (similar to that used by the Hubble Space Telescope), Archives officials were alerted to a deterioration in the glass that protects the Charter documents. Support for this project was provided by the Pew Charitable Trusts to develop a new prototype encasement. NASA and the National Institute of Standards and Technology of the U.S. Department of Commerce are working with the Archives to develop the new encasement and the laboratory in which to transfer the documents. As befits the spirit of the Charters of Freedom, more visitors than ever will be able to view the documents and will learn more about the history and spirit that the documents embody. The re-encasement will also expand the display to include all four pages of the Constitution instead of just the first and last pages which are currently displayed. George Washington's transmittal page will also be viewable. The new display will also make the Constitution and Bill of Rights more accessible to visitors in wheelchairs. The long term vision for the Project features increased interpretative and educational facilities to include a first-time introductory exhibit entitled The American Idea, an education center, a temporary exhibit gallery, a family history center, restored Rotunda murals, conference rooms and a new theater. Building on the White House Millennium Council's commitment to "Save America's Treasures." In his 1999 budget, the President proposed and Congress appropriated $4 million to re-encase the Charters of Freedom. An additional $800,000 in support was contributed by The Pew Charitable Trusts, and today AT&T will announce a $1 million contribution to the overall project. 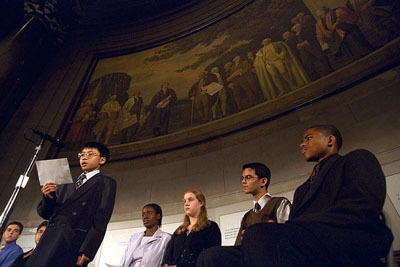 This achievement comes two years after the President announced the formation of the White House Millennium Council at the National Archives Rotunda which houses the Charters of Freedom (August 15, 1997). He and Mrs. Clinton called on Americans to commemorate this unique time in history through meaningful activities that would carry our history and ideals into the next century and new millennium -- in part by working to Save America's Treasures. 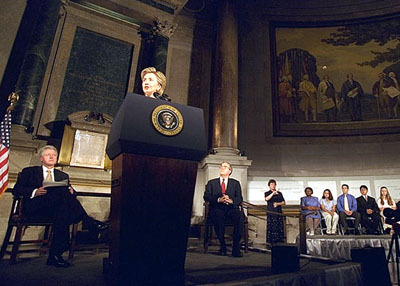 Last year the President and Mrs. Clinton acknowledged the response to their call to action by donors and Congress who together provided nearly $20 million to preserve and endow the Star-Spangled Banner at the National Museum of American History (July 13, 1998). A federal Save America's Treasures grant ($3 million), The Pew Charitable Trusts ($5 million) and Polo/Ralph Lauren ($10 million) all contributed to the conservation of the flag. In addition, Polo/Ralph Lauren provided $3 million to a public education project about that conservation effort. These national icons belong to all of us and bind us together as a nation. Each state and community also possess its own treasures that together tell our nation's story. On May 19, 1999, Mrs. Clinton announced the sixty-two projects that received funding from the new Save America's Treasures federal grants program. She also serves as Honorary Chair of the Millennium Committee to Save America's Treasures that was formed in partnership with the National Trust for Historic Preservation, the National Park Foundation, and Heritage Preservation, Inc. To date, the four partners and the Millennium Committee have raised $33 million in private funds to restore historic sites, collections, monuments and documents. The National Trust also recognizes preservation projects by designating them as Official Projects of Save America's Treasures, and has named 103 to date. Communities are encouraged to make Saving America's Treasures a part of their commemoration and designation as a Millennium Community -- another initiative of the White House Millennium Council. For more information about the Charters of Freedom Project, please contact Naomi Revzin, Development Officer, National Archives and Records Administration, 301-713-6146. For more information about the Save America's Treasures program at the National Trust for Historic Preservation, please contact Carolin Sagawa, Senior Publicity Manager, 202-588-6218.